Do you want to get the same contract electronically signed multiple times by different signers? In that case it’s a hassle to add fields to the contract every time. Therefore, it’s possible to create a contract (template) in which the fields are automatically added. It takes a few minutes to create and test the template, but when done it makes working with SignRequest easier and faster. The above video shows how to create a template within SignRequest. Below we follow the steps one by one. 1. In the menu select "Templates"
- Note that the font size of the input is determined by the height of the field. - If you need to add input to the template before sending (like name, address, amounts etc.) you can assign extra input fields to yourself and add an order of signing so the receiver will only receive the document after you've completed the input fields. 5. Optionally add an order of signing, default subject line, message, attachments and activate the automatic reminders (these settings are also part of the template). You can now select the template on the templates page or while uploading a document. For our "Bulk send" feature you'll need to use option 1. Tags are a way in which you can add data to a contract that are automatically recognised by SignRequest. In this example we use two signers, if less signers are added to the SignRequest by default these will not be shown. So to test and view all tags, we advise you to add at least 2 email addresses. You can open the tag with " [[ " and close the tag with " ]] ". To create a text field use " t ", for a date field use " d " and for a signature field use " s ". Then, add a " | " and a number for every different user. You can change the size of the text, date and signature fields by adjusting the size of the font and adding spaces. You should keep distance between the tags. Preferably an enter or a proper line height. While making a template please be sure to test, before sending to contacts. Signer 0: this is the first person that needs to sign (including you). Signer 1: this is the second person that needs to sign (including you). Which tag is for which signer? The numbers in the tags are used to make distinctions between the signers and group multiple tags (input fields) to one specific signer. The template tags are assigned to the order at which the email addresses are added to the contact field and are not the same as the order of signing. 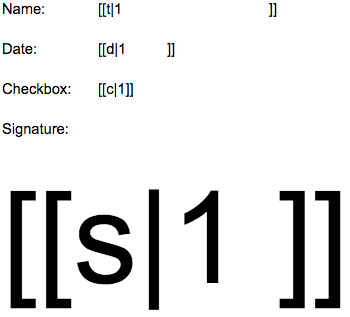 This means that for example “s|1” can be the first or last signer depending on what you specified in the order of signing (if used of course). More or less signers then tags? This document has template tags for 3 signers. 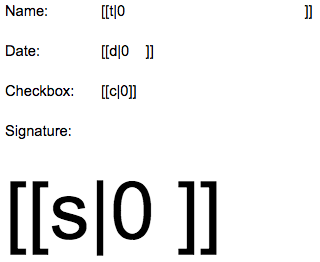 If you only add 2 signers then the last tags (in this example t|2, d|2 and s|2) will not be used. 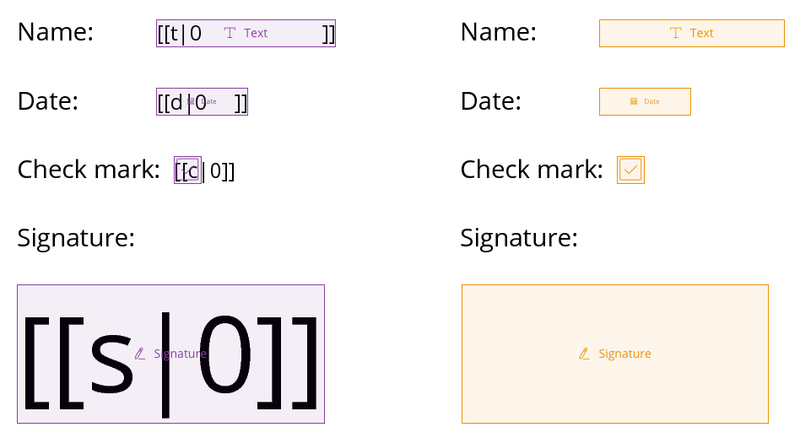 If you add more signers then tags then those signers will still be able to sign the document, but will not be directed to the locations in the document and have the ability to add text, dates and signatures wherever they want in the document. In this case you’ll be assigned to the t|0, d|0 and s|0 tags as by default the sender is always the first added email address. The t|1, d|1 and s|1 tags will be for the next added email address and the t|2, d|2 and s|2 tags will be for the other email address. In this case the t|0, d|0 and s|0 tags will be assigned to the first added external email address. The t|1, d|1 and s|1 tags will be for the next added email address and the t|2, d|2 and s|2 tags will not be shown at all. Tip: to easily test documents with tags you don’t really need to send them out, after uploading and adding the email addresses you can easily view the result by clicking on “Prepare document”. By default the text fields and signature fields are required. The checkbox field can be skipped by default. You can also add a name to the fields by adding “n:examplename”. Currently that name is only visible in the pop-up window after clicking on the field. In the future we will also add that name to the field thus replacing “Text”. By default the date field will be pre-filled automatically with the date of signing. In some cases however this is not useful, for example with a date of birth. In that case you can use "p:0" to prevent it from being pre-filled. You can add an ID to the fields by adding “id:examplename”. This ID can be used to export data in an excel file or by using the API to pre-fill or export these fields. These are shared Google Docs documents with example tags. If you have our Google Docs Add-on you can directly send a SignRequest! If you don't have our Google Docs Add-on for electronic signatures, go to "Add-ons" in the Google Docs menu bar and install the Add-on for free. Then, go back to "Add-ons" and click "SignRequest".